The calender says it is fall, and that is good enough for me. Here in the Dallas area, where we just had one of the hottest summers on record, the temperatures are still hovering around 90 most days. Yes, it is still warm but I know fall is coming. How do I know when it is so warm? Well, our local Oktoberfest festival has started and that puts me in the mood for large mugs of beer, bad polka music, and warm bowls of soup. 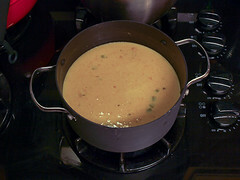 In this case the soup I craved was cheese soup, and I really wanted one made with beer. 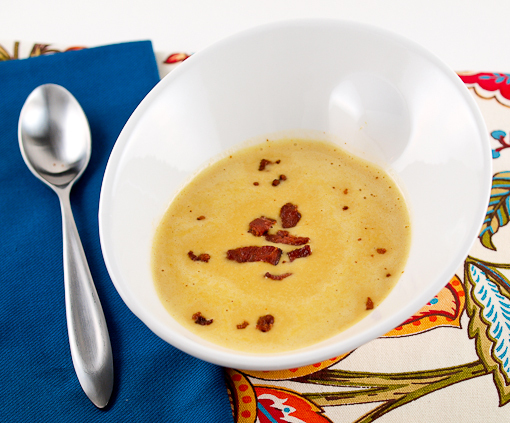 I often find beer cheese soup does not strike the right flavor balance. To be precise, I find most beer cheese soup to have a slightly bitter finish. While a little bitterness is nice to cut the richness of the cheese, too much bitterness makes the dish hard to eat. To counter the bitterness of the beer I added a tart Granny Smith apple to this soup. 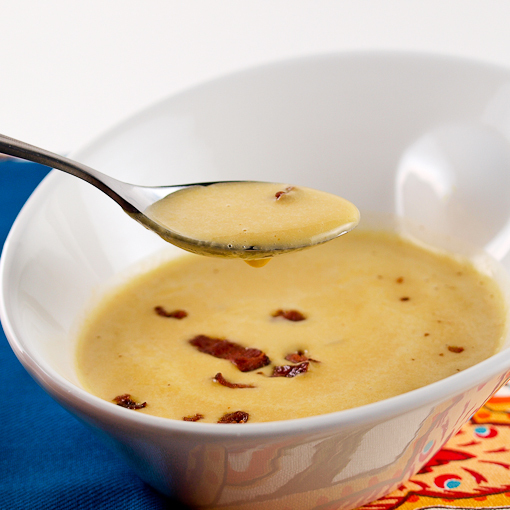 The tartness keeps the soup from being too sweet, while the natural sweetness counters any lingering bitterness. In honor of the season, and because I love it so, I used an Oktoberfest style beer in this recipe. Any amber beer you like will work, but for the sake of the season, and because they are readily available, I opted for the Oktoberfest. In a medium pot over medium heat add the chopped bacon. Cook until the bacon is very crisp, about 3 minutes. 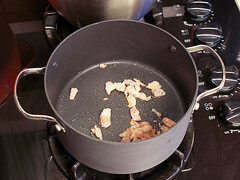 Remove the bacon from the pot reserving the fat. 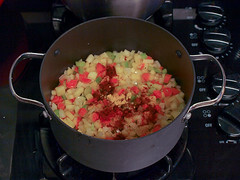 Add the butter to the pot and once it foams add the onion, apple, carrot, celery, salt, and pepper. Cook until the mixture is starting to become tender, about 5 minutes, then add the dry mustard, paprika, and cayenne pepper. Stir to combine and cook for another 5 minutes, or until the vegetables are very tender. Add in the sliced garlic and cook until fragrant, about 1 minute. 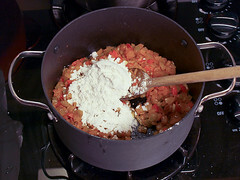 Add in the flour and cool for 3 minutes, stirring constantly, to cook out the raw taste of the flour. Reduce the heat to medium-low and slowly add in the chicken stock, beer, and milk, stirring constantly to remove any lumps of flour. You may need to whisk it during this process. 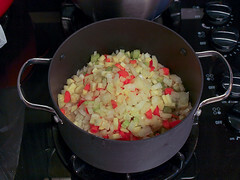 Once combined increase the heat to medium-high and cook until the soup comes to a boil and thickens, about 5 minutes. Remove the pot from the heat and allow to cool for 3 minutes. 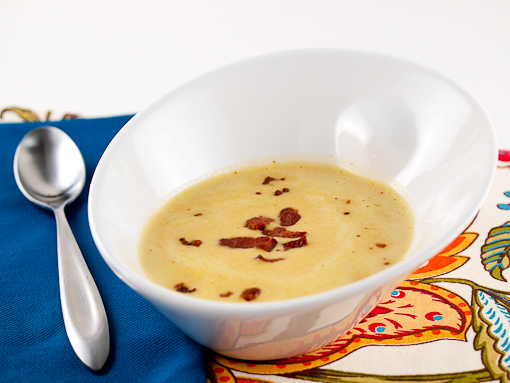 Working in batches, blend the soup in a blender until very smooth, about 3 minutes on the highest speed. 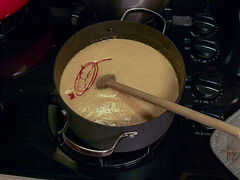 Add the cheese, in batches, to the soup and blend until the cheese is melted. Once all the soup is blended return it to the pot. Heat the soup over medium heat to re-warm. Season with hot sauce, and additional salt and pepper as desired. 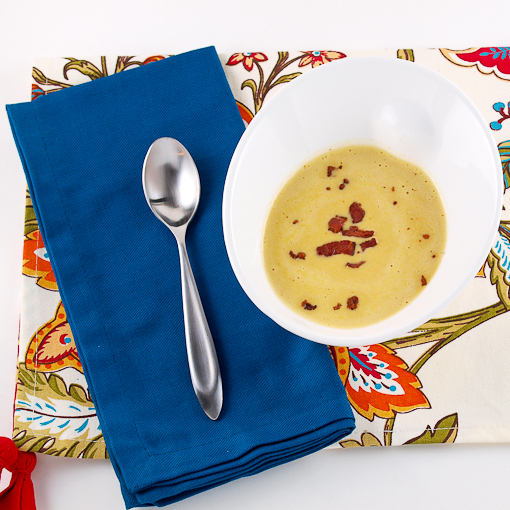 Serve the soup with the chopped bacon as garnish. Enjoy!